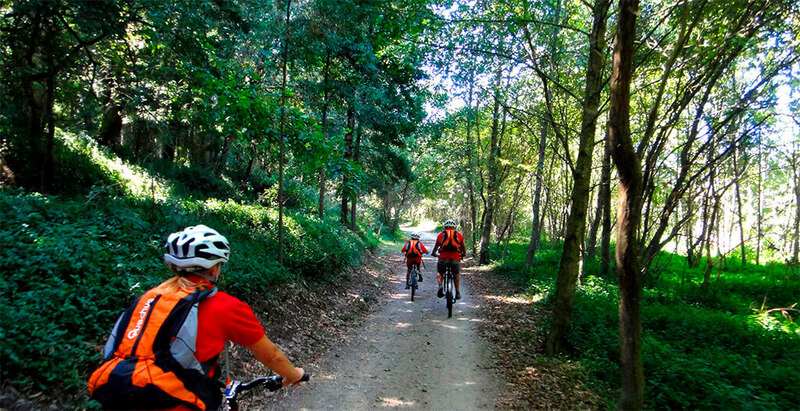 Exploring Portugal by bike is a unique experience you can enjoy 365 days a year. Set your own pace and embrace adventure! 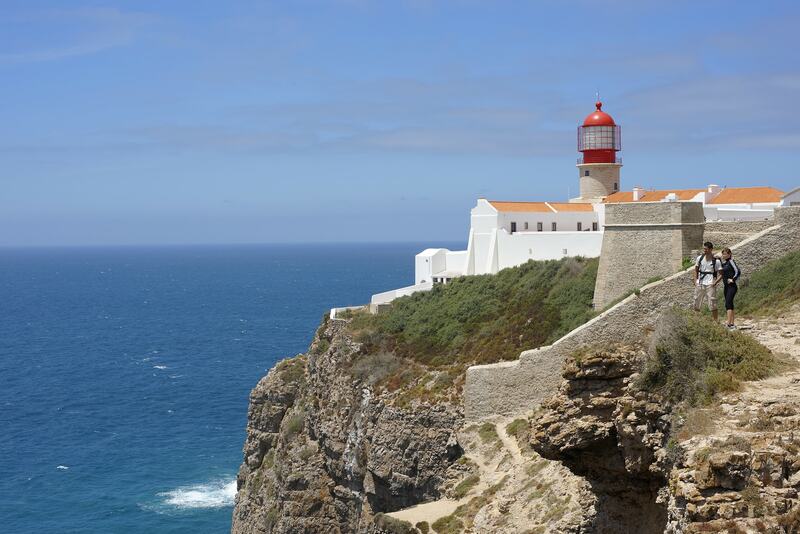 If you prefer to stay by the sea, you can enjoy the magnificent Atlantic coast landscapes, beaches and cliffs. Inland, you can visit historic towns and remote villages, go up and down the hills or get to know a great variety of natural parks. 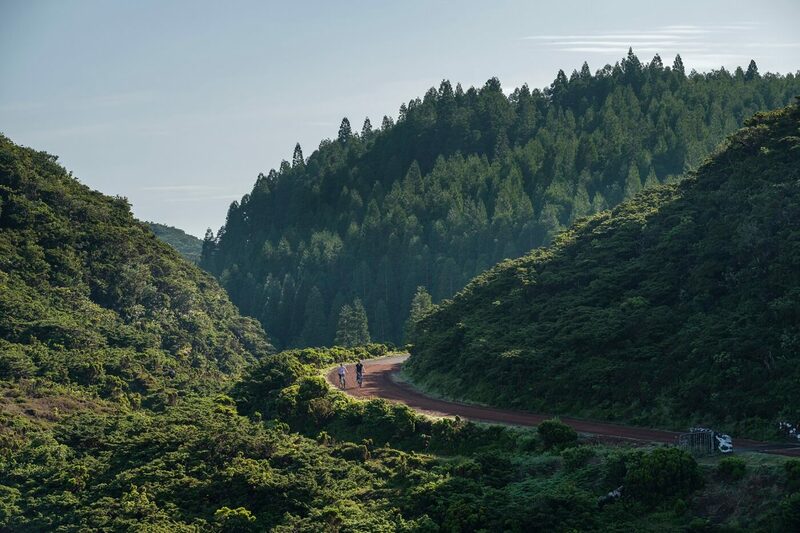 From North to South, as well as in Azores and Madeira, the variety of cycling trails offers a wide diversity of experiences for touring, road or mountain bikes. All presented Routes and trails have guides and maps with all information you may need. If you are looking for an organized trip, please check the available company Programmes and services, like specialized guides, road maps and gastronomic experiences, visits to monuments or to local handicraft stores. You can select whatever option best suits your interests and your available time. 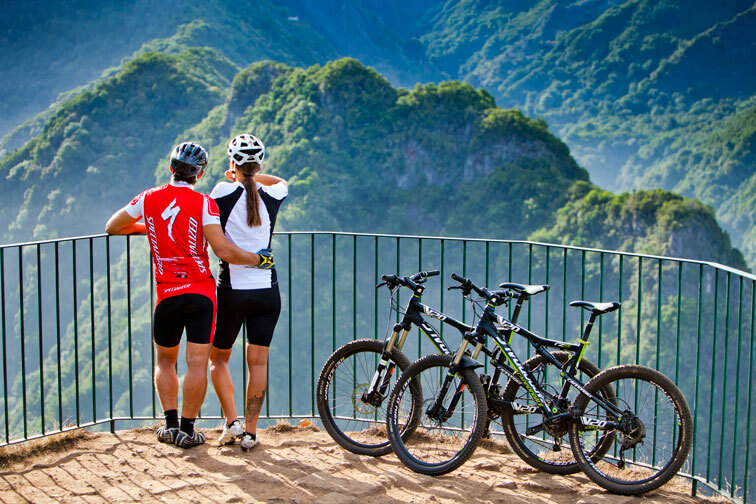 However, if you are looking to travel alone, companies can also provide you with self-guided tours and the most convenient support Services, including bike rental. 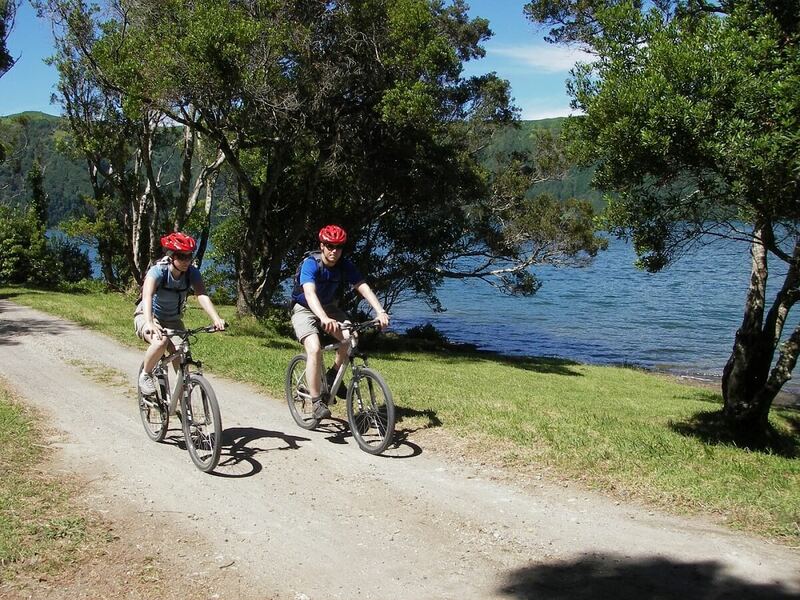 Many accommodation units – rural tourism, hotels, local accommodation – are prepared to accommodate cyclers. You can also find information about bike stores and workshops. 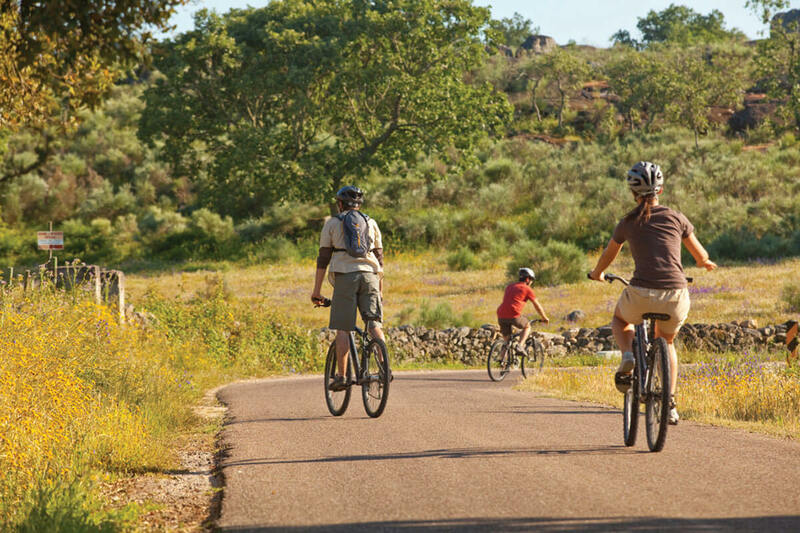 Dare to combine bike trails with other nature activities, explore the national heritage and turn your cycling trip to Portugal into an experience to repeat in another Region, Route or trail. 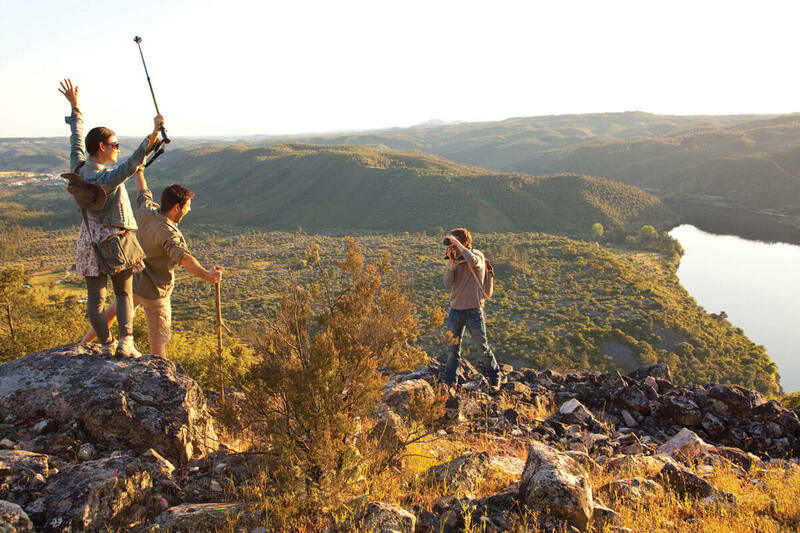 Walking is one of the best ways to explore Portugal and you can do it all year long. Come find out more! 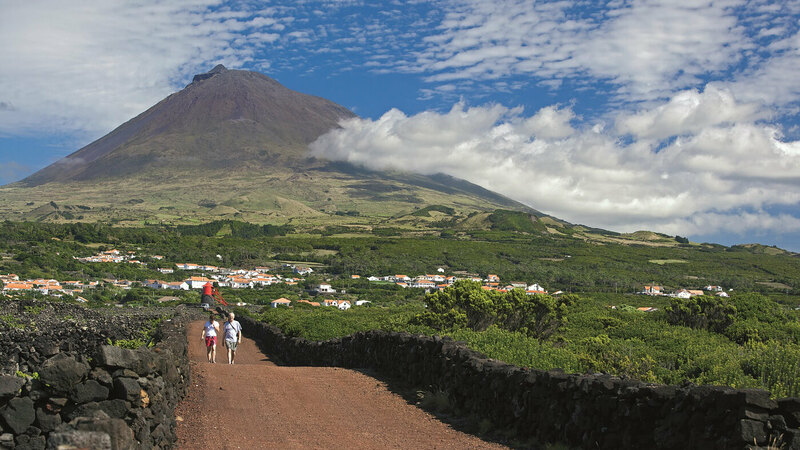 You can find in all regions, including Azores and Madeira, a great variety of trails that meet all tastes and interests: whether it is by the sea, villages and towns, along the levadas (typical irrigation channels) or trails, pedestrian walks can have well-defined starting and ending points, or be enjoyed simply for the pleasure of walking and seeing all that comes in your way. All presented Routes and trails have guides and maps with all required information to start your walk. You may choose between Large Routes or shorter and easier trails. We recommend Programmes organized by companies, with specialized guides who will help you uncover all interest sites and with additional services for experience improvement: accommodation of different categories, regional gastronomy and visits to local culture. If you prefer to walk at your own pace, companies can also provide you with self-guided tours and other Services you may wish to add to your experience. 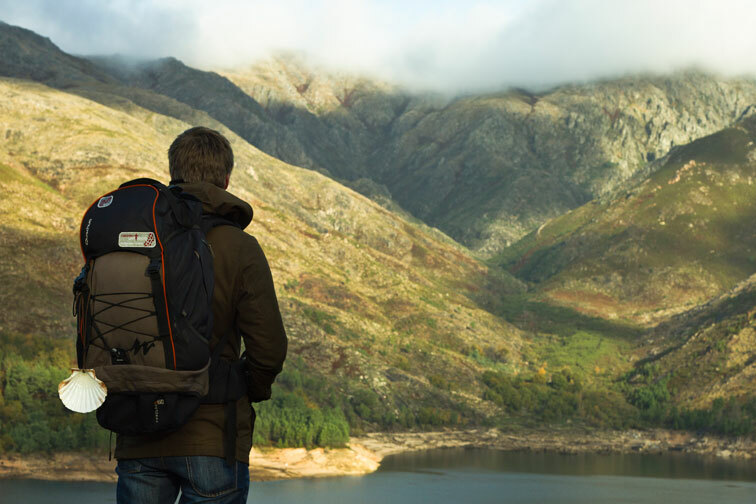 Simply choose where to begin and go on exploring another Region, Route or Trail. The bike is a vehicle of exploration for excellence. 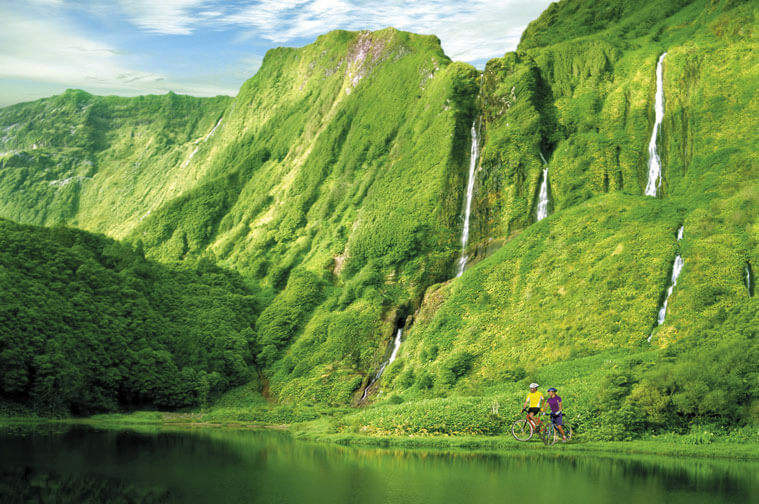 Destinations like the Açores, where nature and the trails marked within it are a constant, make this destination a true adventure for people looking for thrills. 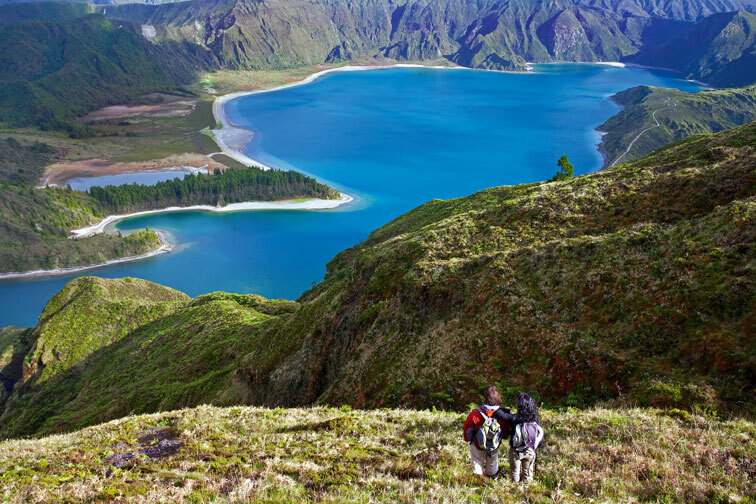 From the ultra-technical single tracks that link the highest mountains to the beaches and fajãs of the islands, and from the rolling roads that encircle the lakes or cross the mountains, rich in endemic fauna and flora, the route Biking Açores has options for all tastes and technical abilities. 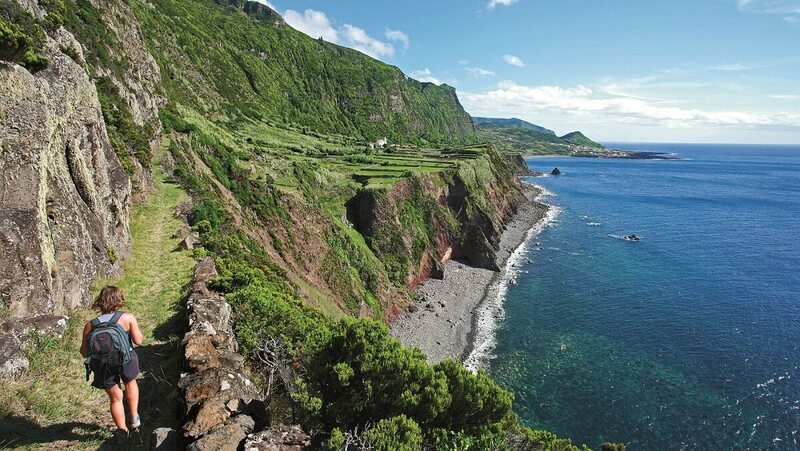 If you would rather cruise along the roads, the islands have an extensive road network lined with hydrangeas and Cryptomeria forests, linking all places whose landscapes and culture are notable, crossing pastures, mountains and places of great beauty and interest. All this with the possibility of ending a day trip somewhere where there are hot water pools, either in the sea or in natural swimming pools. 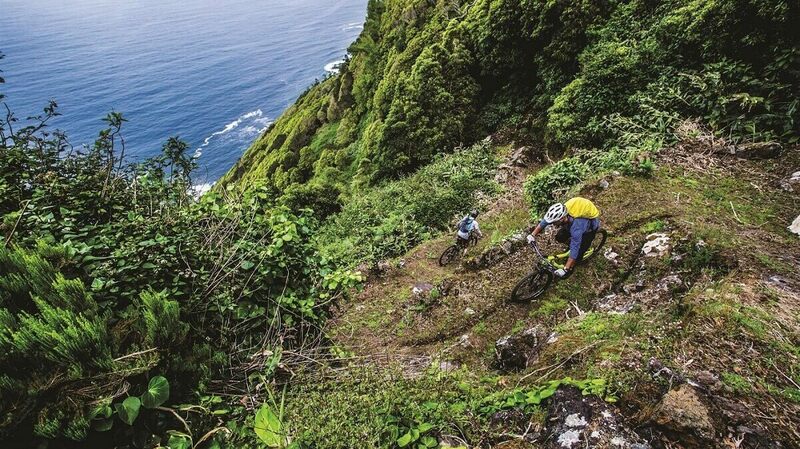 We suggest the Route that has 4 trails on 4 different islands, where you can choose to cycle for long stretches on the road, or take a combined trail, or opt for an Enduro adventure, touring the Açores' iconic landscapes, which perfectly exemplify the variety and richness that make this destination one of the most beautiful in the world, a distinction already awarded by National Geographic Traveler and European Best Destinations. 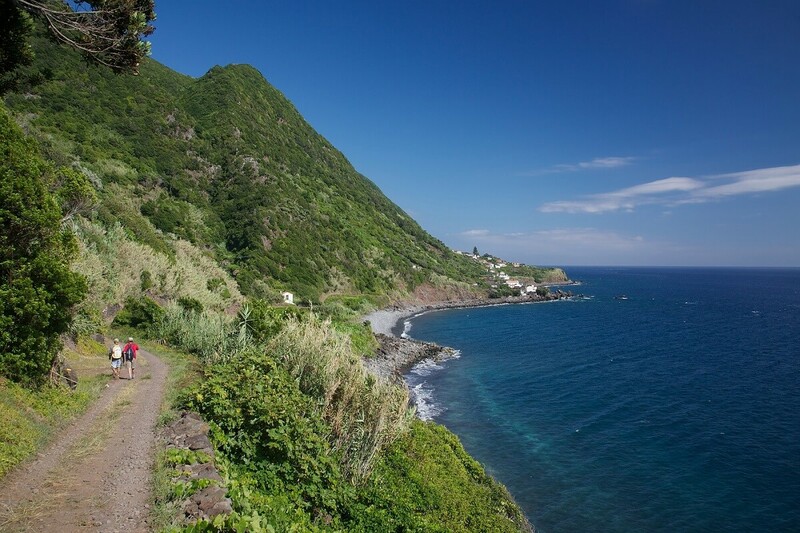 Venture out and discover the magical corners of the Azorean islands by bicycle. 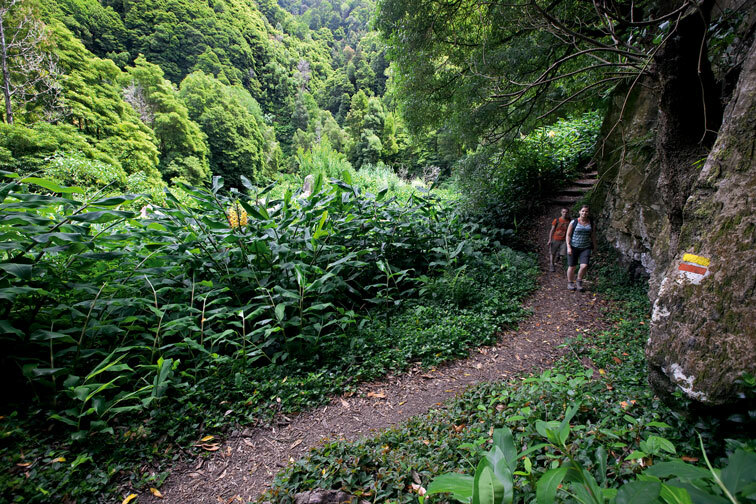 The official network of Açores hiking trails comprises 80 signposted paths that cover a total distance of more than 800 km. Classified according to the degree of difficulty, distance and type of path, they enable you to learn about the way of life of the local people in harmony with nature and guide you to visit the most beautiful areas of each island, where the volcanic landscapes and the mysticism of the natural forests are the outstanding features. To sum up everything available on the network of official Açores trails, we would indicate the route Trilhos dos Açores where we suggest 1 walking route per island, with different features. This perfectly exemplifies the variety and richness that make this destination one of the most beautiful in the world, a distinction already awarded by National Geographic Traveler and European Best Destinations. 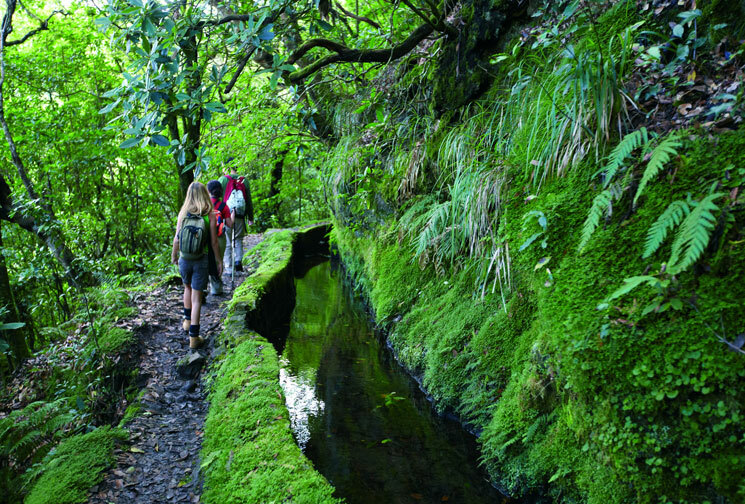 Take advantage of the mild climate to venture along the Açores Trails at any time of the year, for an unforgettable experience. 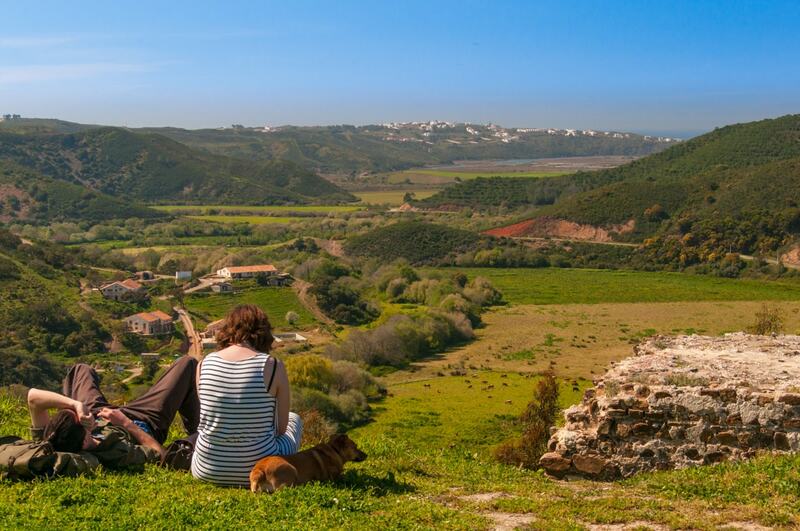 You will find one of the best preserved coasts in Europe, World Heritage cities and some of the most authentic gastronomic traditions in Portugal in the Alentejo, but there is much more to discover in this region. 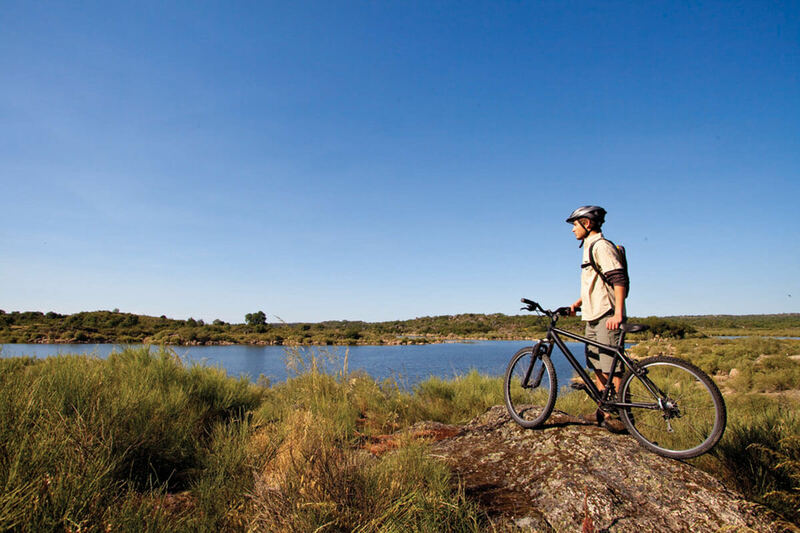 The Alentejo is the ideal location for those who want to cycle through landscapes of great diversity, along small rural roads or along the seafront, following a occasionally rocky coastline or long sandy beaches. 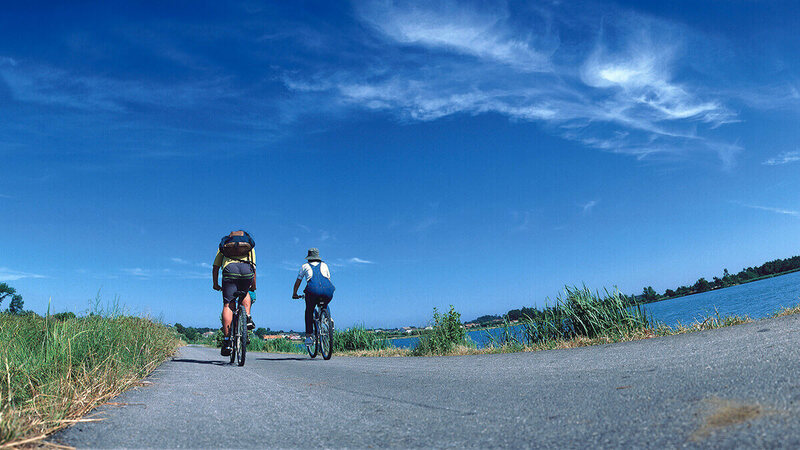 Between September and May, when the weather is milder, follow the cycling routes the region has to offer. 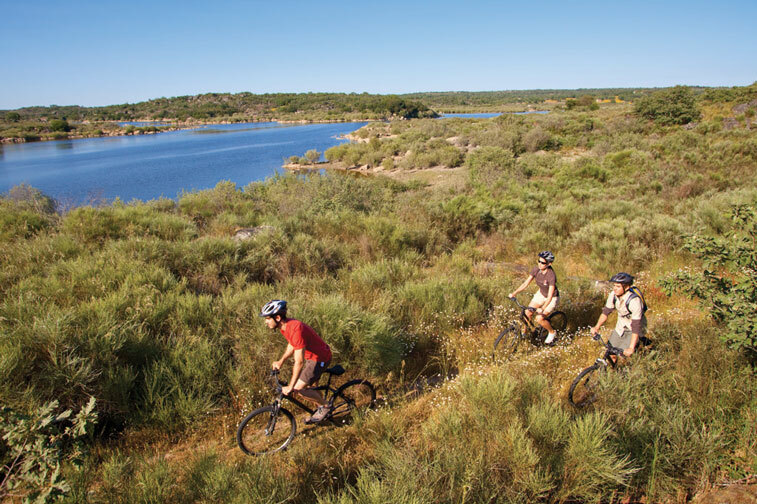 If you prefer the challenges of mountain biking you can follow Rota Vicentina, which is also pedestrian and takes you along forest paths, through small towns and villages and is not too far from the Atlantic coast and the Natural Park of Southwest Alentejo and Costa Vicentina. On your way, make sure to visit the Roman city of Miróbriga. You won’t want to miss out. The Eurovelo 1-Rota da Costa Atlântica follows the whole of the region’s coastline and allows you to discover its diversity: The cliffs of the Natural Park of the Southwest Alentejo and Costa Vicentina, the Natural Reserve of Santo André and Sancha, the endless sandy beaches, the rice fields and, last but not least, the Natural Reserve of the Sado Estuary. Be sure to visit the Roman ruins of Troia, the largest roman fish salting production centre, and the Carrapateira Palafitic fishing port. 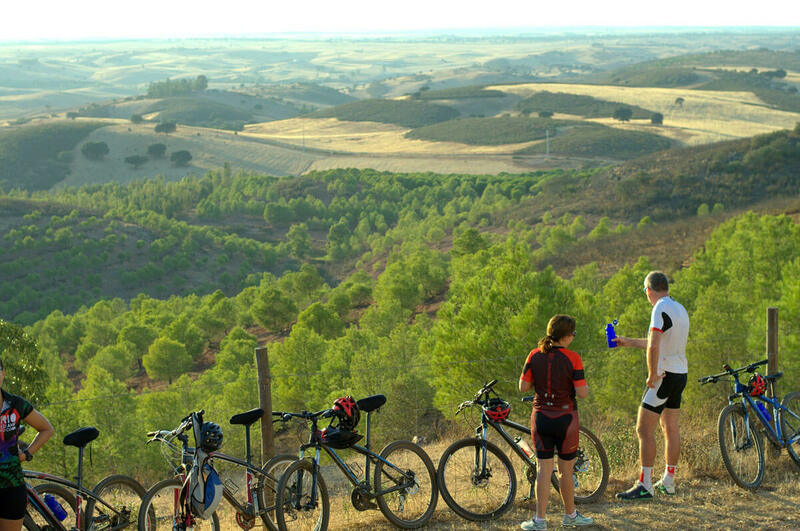 Every bike trip in the Alentejo will delight you! There are Programmes and Services available to make this experience absolutely unforgettable. 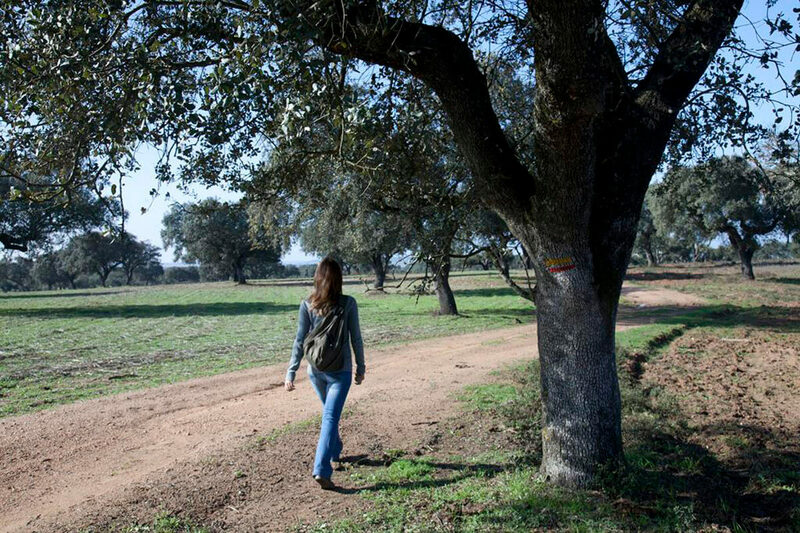 If you enjoy hiking and are looking for an experience to help you get back in touch with nature and culture, the Alentejo is an ideal choice! 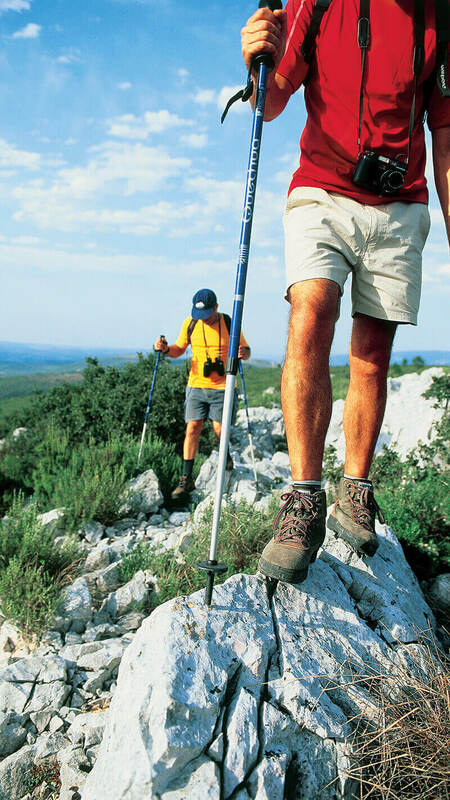 Between the months of September and May, when the weather is most favourable for walking, come discover the region’s network of hiking routes. 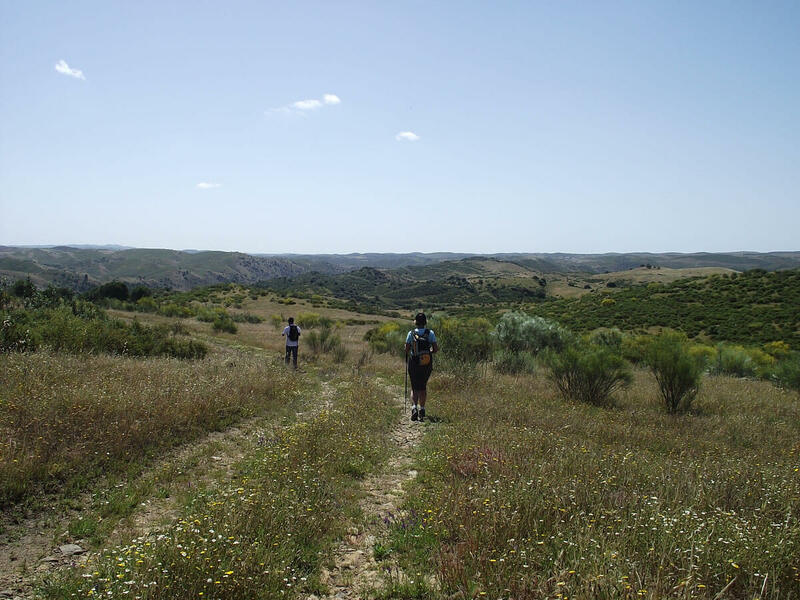 The Alentejo Feel Nature, hiking network in the north-east of the region covers the Serra de São Mamede Natural Park, the region's only point above 1000 meters of altitude, the Naturtejo Geopark and the Natural Monument of the Portas de Ródão. This network includes 30 short trails and 3 long trails, linear and circular, with different levels of difficulty, totalling 435kms of route. To the south, along the border with Spain, the TransAlentejo Alqueva network is located along the river Guadiana and the large Alqueva reservoir and also includes the Natural Park of the Guadiana Valley. These 11 short pedestrian routes, mostly circular, total 159km of trails with different levels of difficulty. On the coast the Rota Vicentina Vicentina offers two options: Trilho dos Pescadores (The Fisherman's Trail) follows the shore for 120km, between Porto Covo and Odeceixe (Algarve), following one of the wildest stretches of coast in Europe, in the Natural Park of the Southwest Alentejo and Costa Vicentina; while the 230km long Caminho Histórico (Historic Route) connects Santiago do Cacém to Cape St. Vincent (Algarve) through forest paths, towns and villages, and is certified as one of the "Leading Quality Trails - Best of Europe" by the European Ramblers Association, making it one of the best hiking destinations in Europe. Whatever your choice, the experience will be worth it! There is plenty of information available about the Trails, os Programmes e os Services offered in the region. 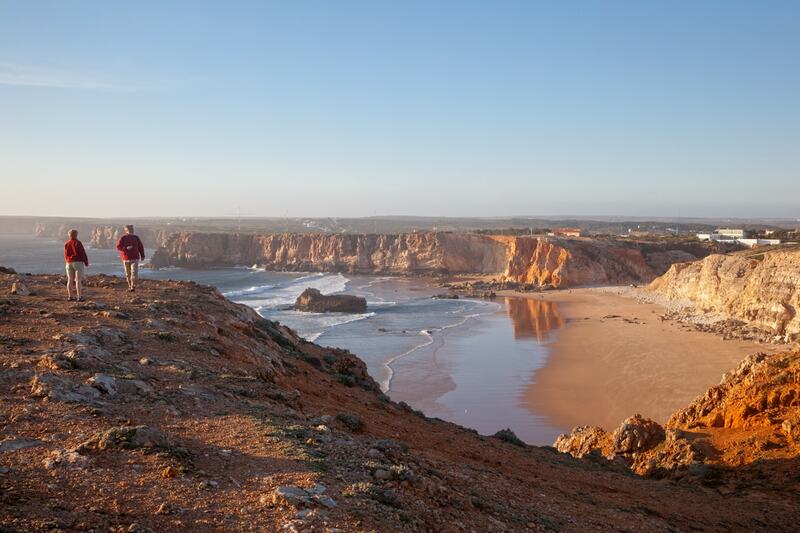 Some of the world’s most beautiful beaches and most awarded golf courses are located in the Algarve, but there is much more to unveil in the most southern part of Portugal. 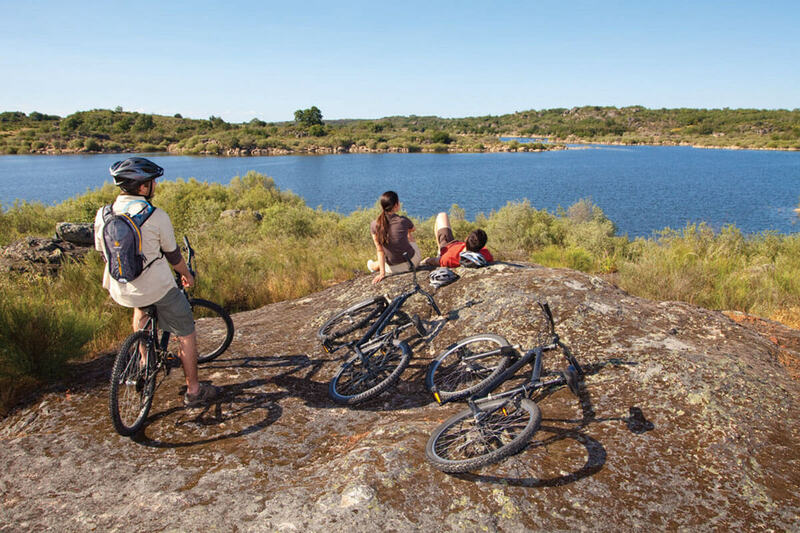 Algarve is the right destination for those who enjoy cycling and exploring different landscapes or for those who enjoy staying by the sea. 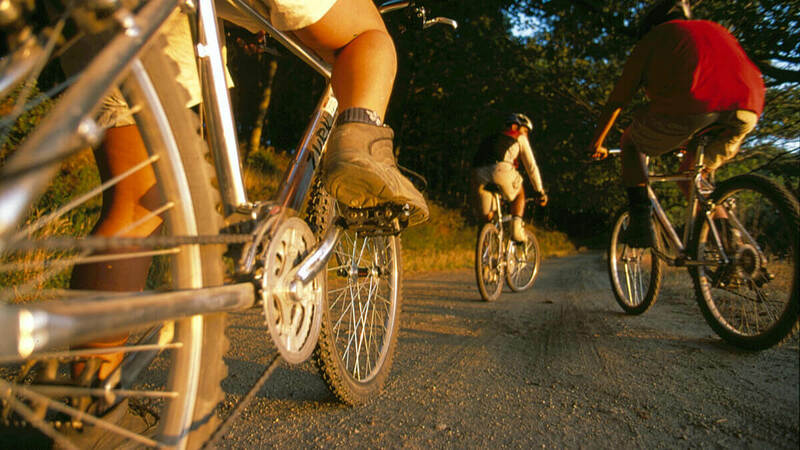 Between September and June, enjoy the region’s pleasant climate and explore the available network of cycling routes. 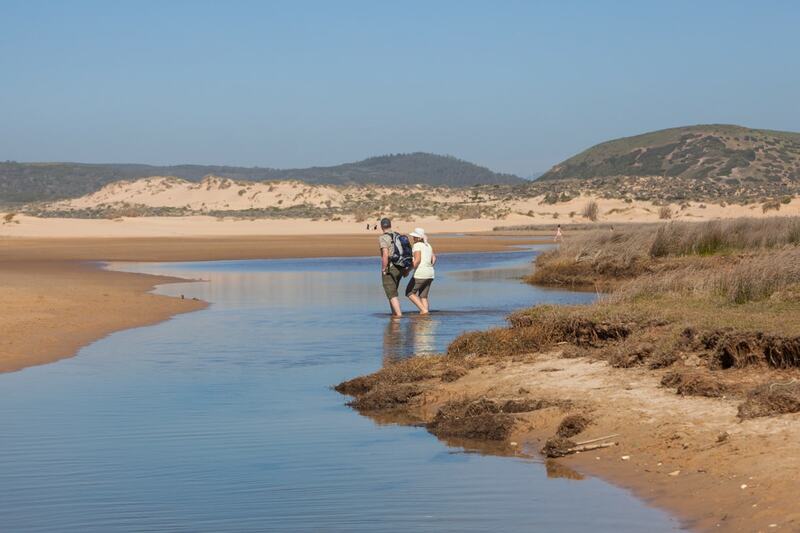 If you enjoy the challenges of mountain trails, you may choose between the Via Algarviana, the Rota Vicentina or the Rota do Guadiana, extending along a rural and authentic part of the Algarve, sprinkled by villages and towns with a distinctive natural and cultural heritage, and not very far from the Atlantic coast. 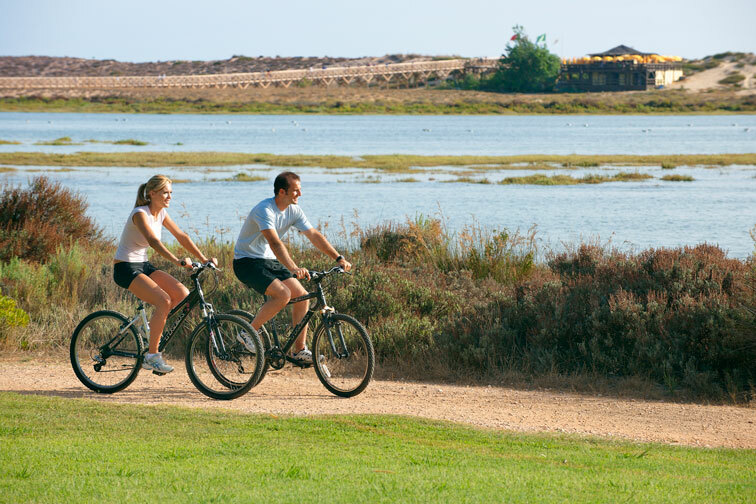 The Eurovelo 1- Costa da Rota Atlântica, known in the Algarve as the Ecovia do Litoral, extends along the coastal line and near the Ria Formosa Natural Park. 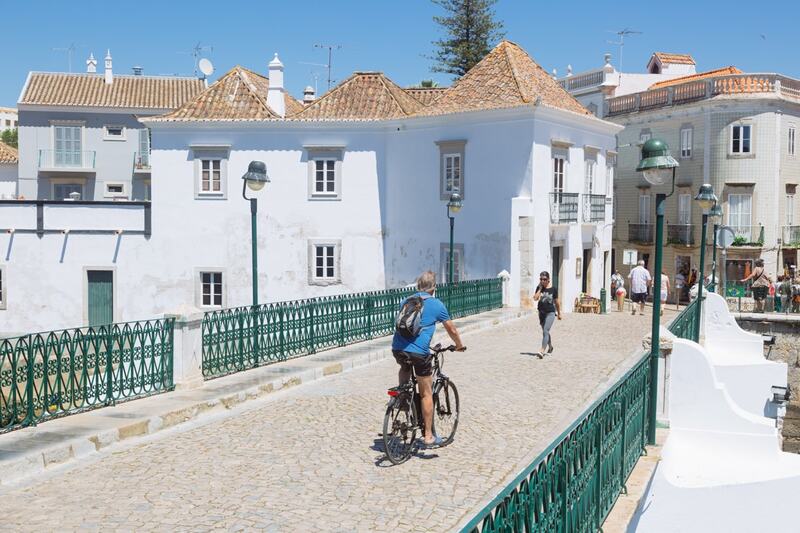 You can cover its whole extension, in km, or you can cycle across small sections that will allow you to explore villages and cities of the Algarve coastline. 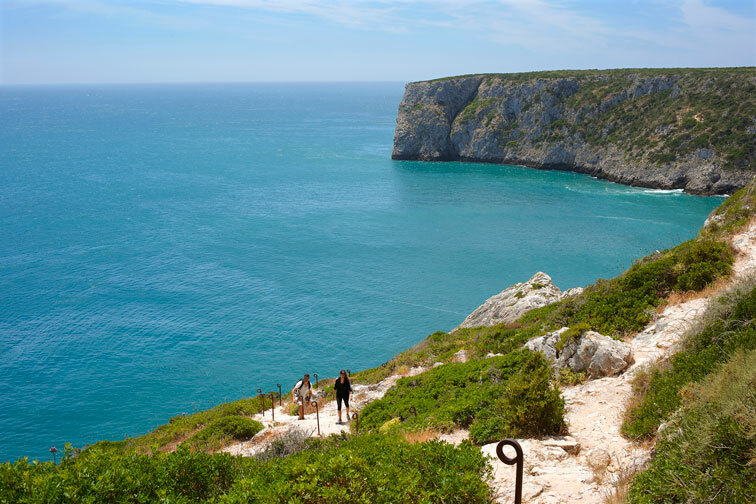 Don’t miss the Cabo de S. Vicente – Europe’s most western point. 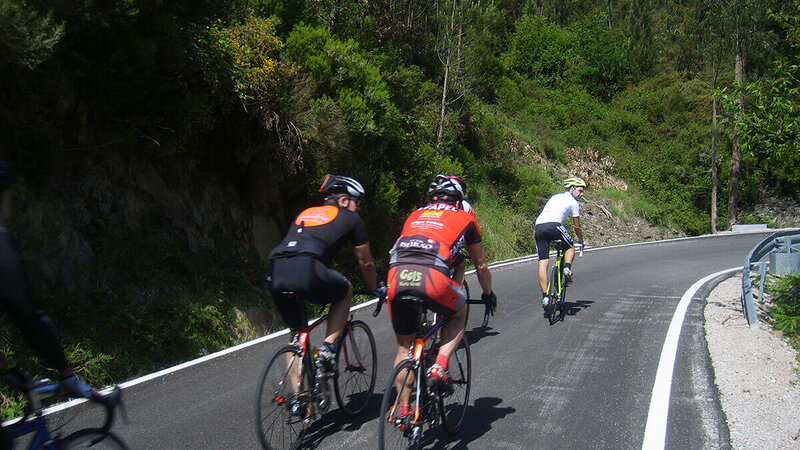 If you are a road bike enthusiast, you may choose from a number of Percursos de Ciclismo de Estrada where you will be able to combine the challenging distance and going up and down the hills by roads with little traffic with a great variety of landscapes. 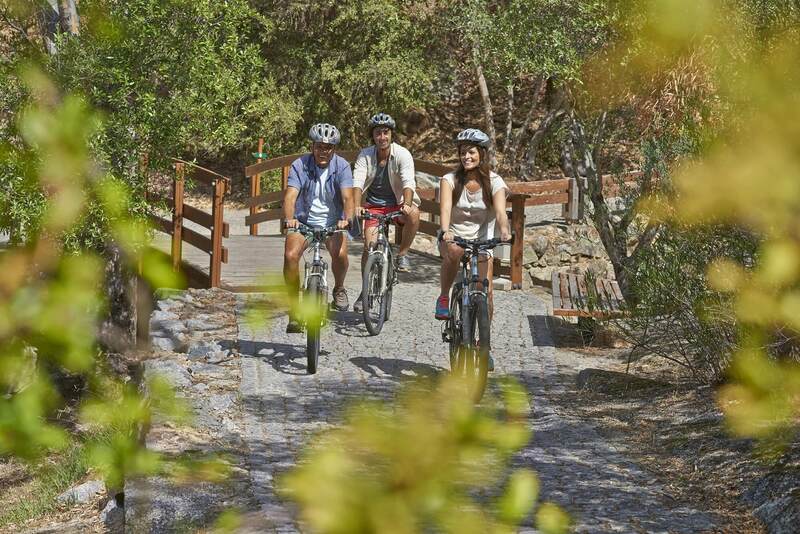 You are the one deciding how you want to explore the Algarve by bike! Programmes and Services are available to help you make this trip an unforgettable experience. 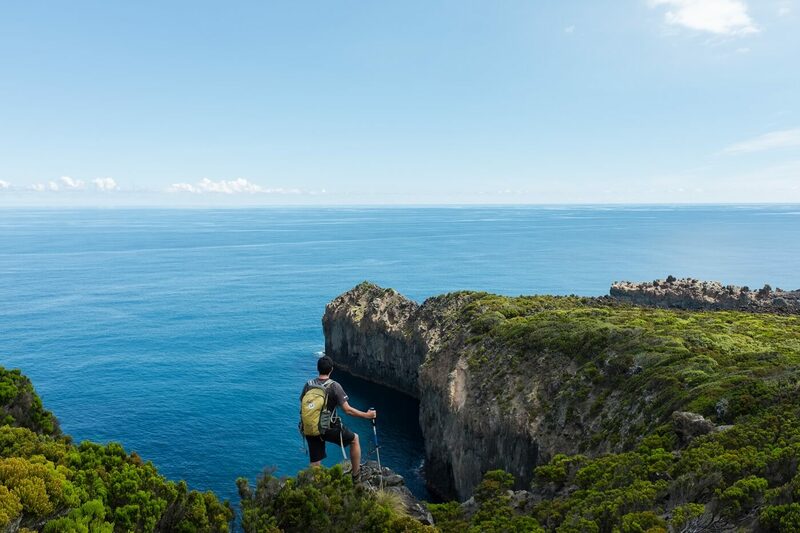 If you enjoy waking and intend to experience nature adventures, the Algarve is a great destination for you! Between September and June, when the climate is pleasant and favourable for walks, come explore the network of pedestrian trails this region has to offer. 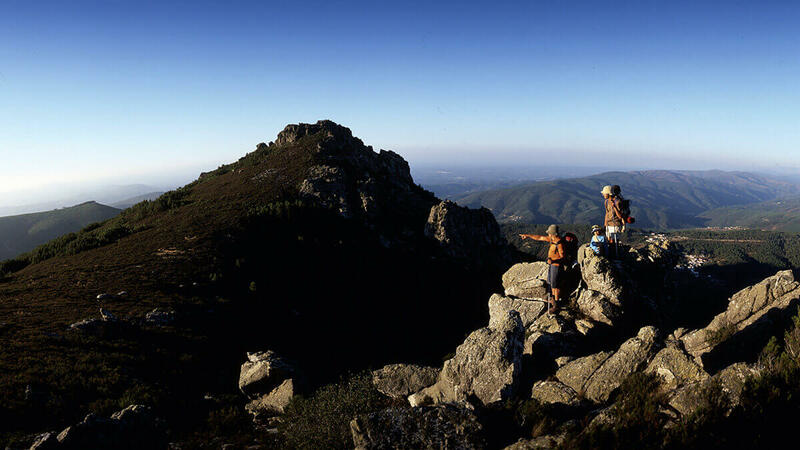 The Via Algarviana extends across the whole region, connecting Alcoutim to Cabo de São Vicente, making a total of about 300 km along places like Serra do Caldeirão, Serra de Monchique, and the Southwest Alentejo and Vicentine Coast Natural Park where you can see a great variety of fauna and flora, and the traditional rural villages. There are many linear and circular trails of different lengths and difficulty degrees available. 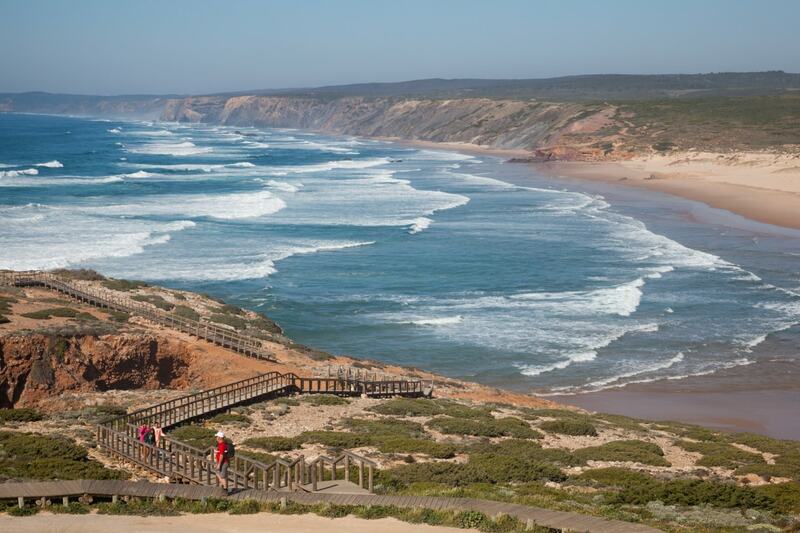 The Rota Vicentina has 400 km of signalled trails across one of Europe’s most beautiful and well-preserved coastal areas. 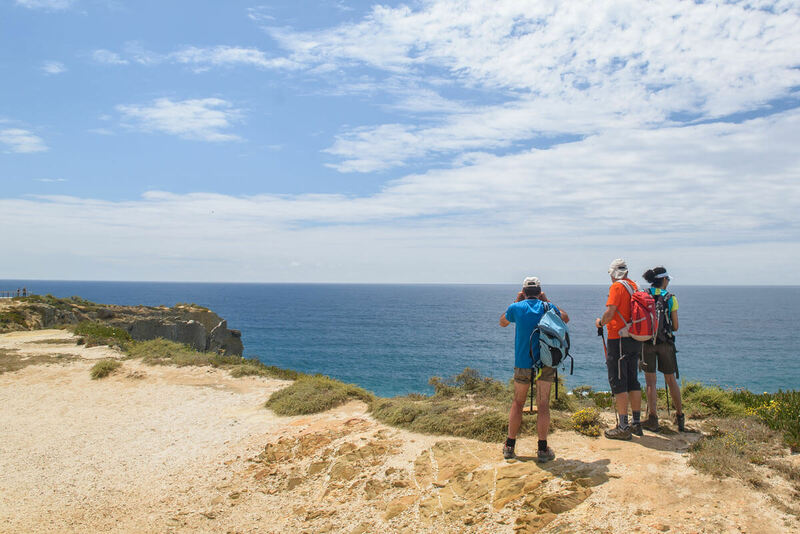 You can choose the “Trilho dos Pescadores”, an trail with 120 km by the sea, or the “Caminho Histórico”, an trail with 230 km divided into several stages that extends through a rural landscape and goes across several forest paths, villages and towns. 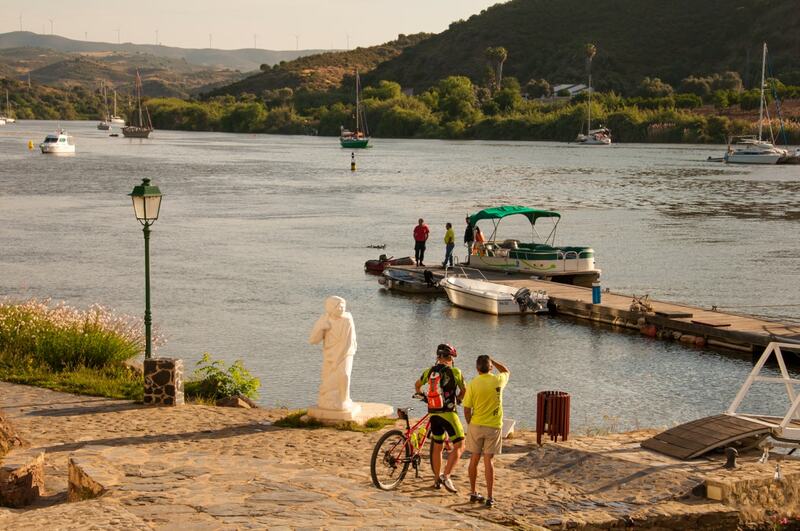 The Grande Rota do Guadiana (GR15) (Guadiana Long Distance Route - GR15) connects Vila Real de Santo António to Alcoutim and extends over a total of 65 km, across mountain, barrocal and coastal areas, with Guadiana River being its main attraction and offering stunning panoramic views. Regardless of your choice, the experience will be worth it! Please consult the available information on local companies regarding the different Trails, Programmes and Services. 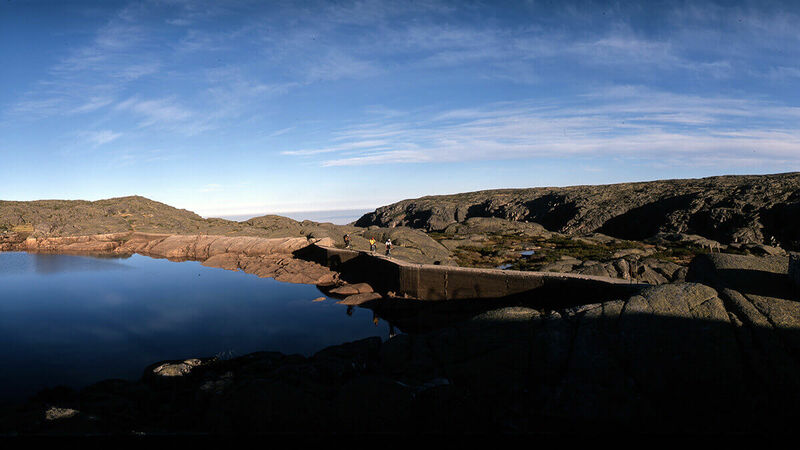 The Grand Route of Portugal’s Historical Villages runs close to the Serra da Estrela National Park, Gardunha and the Malcata National Reserve. 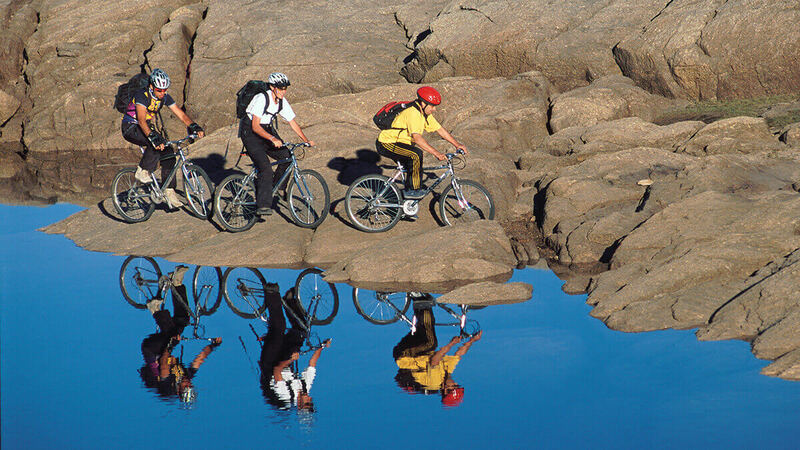 This circular route is nearly 600km long and can be explored by bike. It is split up into 12 stages that start and finish in one of the 12 Historical Villages in Portugal. 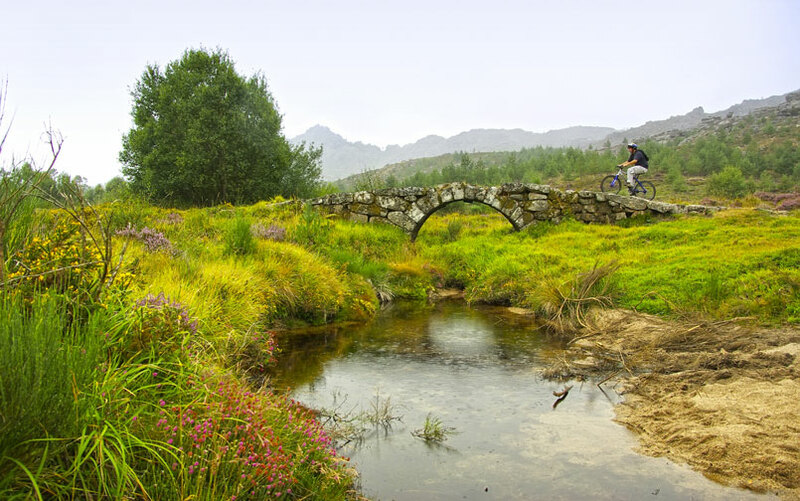 The Zêzere Grand Route, is over 370 km long and follows the Zêzere from its source, in the Serra da Estrela, to its mouth in Constância, where it meets the River Tagus. This Route runs through the territory of the Xisto Villages and can be enjoyed in sections or multi-surface sections. 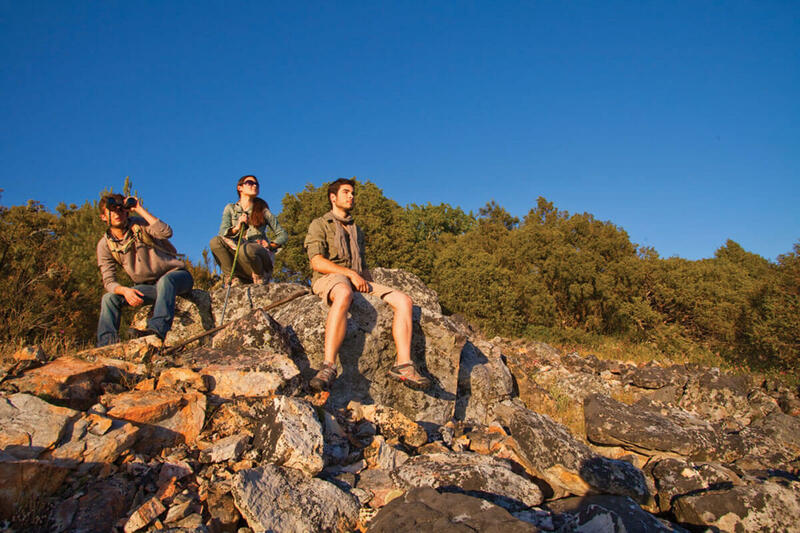 Venture into the beautiful landscapes surrounding the Côa River and discover primitive art on trails forming part of the Côa Grand Route, running from the Centre to the north of Portugal. Listed as a World Heritage site since 1998, the Coa Valley, is widely considered as the most important site with open air rock art. Also discover the Dão Ecopista, the longest in Portugal, and one of the most beautiful. 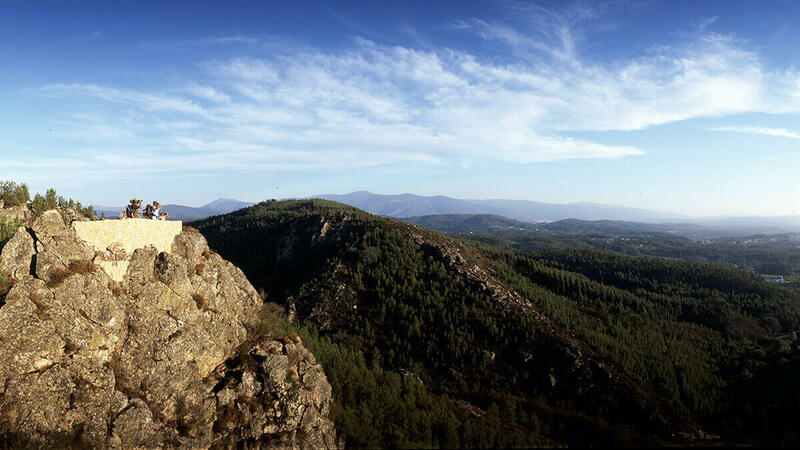 It is surrounded by the Estrela and Caramulo mountains and the Dão and Mondego rivers. It is almost 50km of easy cycling. 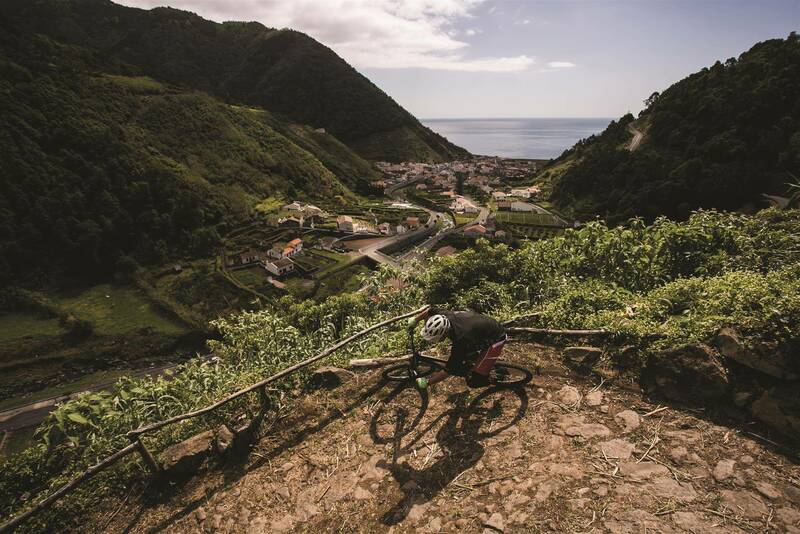 If your passion is mountain biking, central Portugal’s mountains such as Gardunda, Caramulo and Lousã are perfect for enjoying this sport. 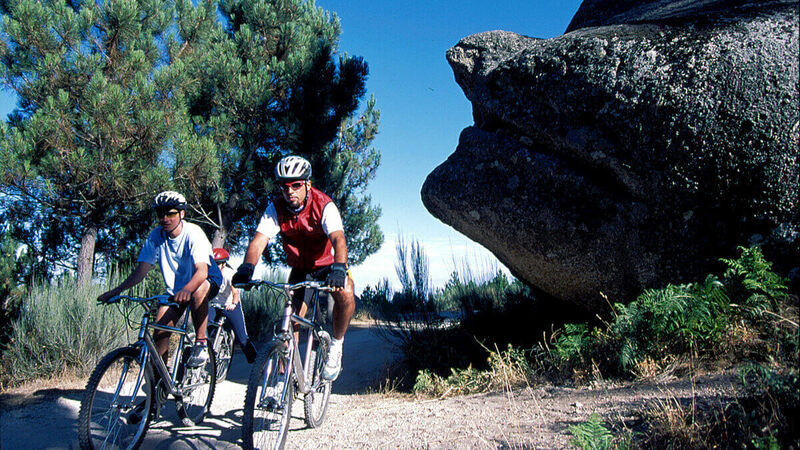 Emphasis should also be placed on Serra da Estrela, the highest in continental Portugal, where conquering Torre is a challenge for any serious competition cyclist. 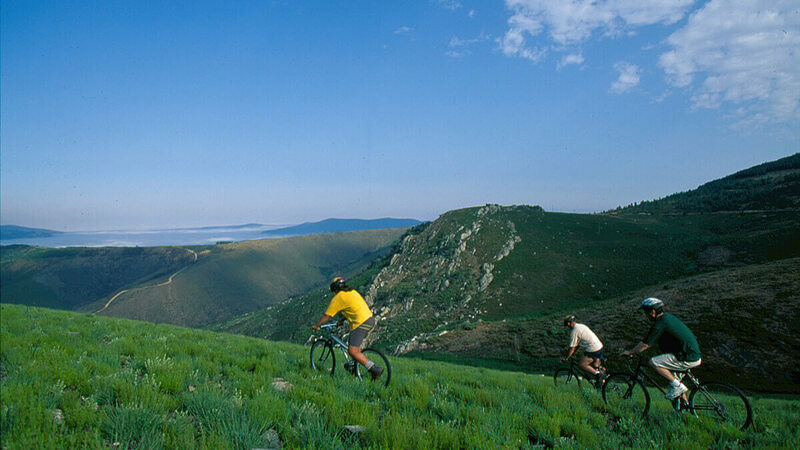 The region has a Network of MTB Centres with marked trails with four difficulty levels. 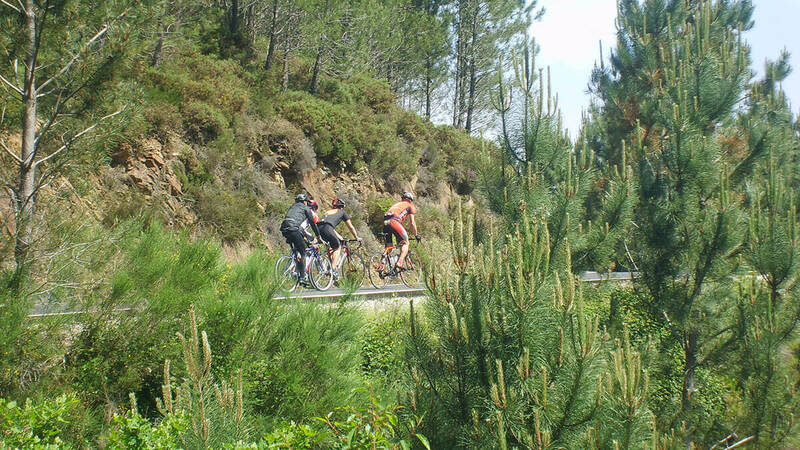 And because touring the coast by bicycle is an enormous pleasure, discover it on Eurovelo 1 – Atlantic Coast Road, which crosses Portugal from north to south. 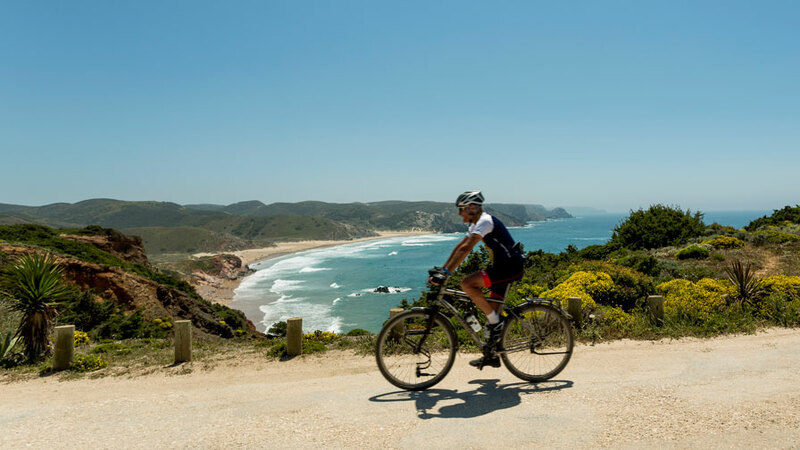 In central Portugal the route has a length of 388 km, from Praia de Santa Cruz in Torres Vedras near Peniche (section 11) to Aveiro (on section 16). Throughout this route there is always the bonus of enjoying stunning scenery and being able to stop for a dip whenever you fancy. 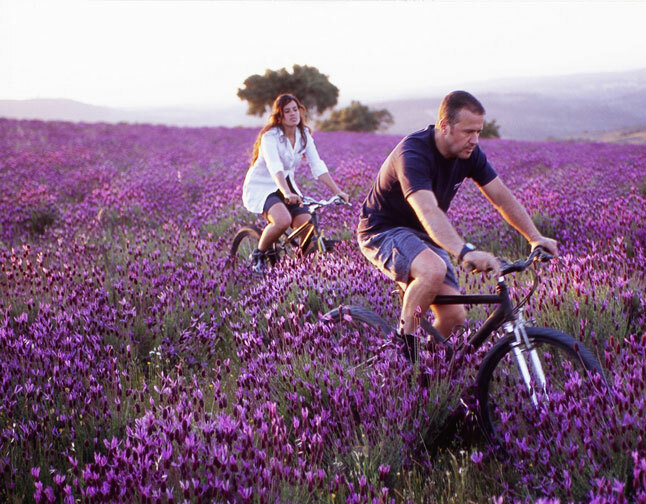 It’s up to you to decide how you want to discover central Portugal by bike! A range of Programmes and Services are available to help make this an unforgettable experience. 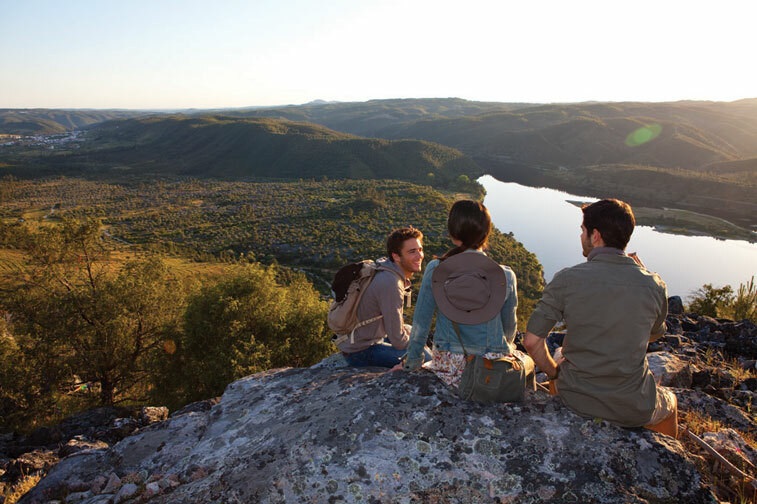 Mountains are a major feature of central Portugal’s landscape and offer endless route options for discovering nature, its people and villages. 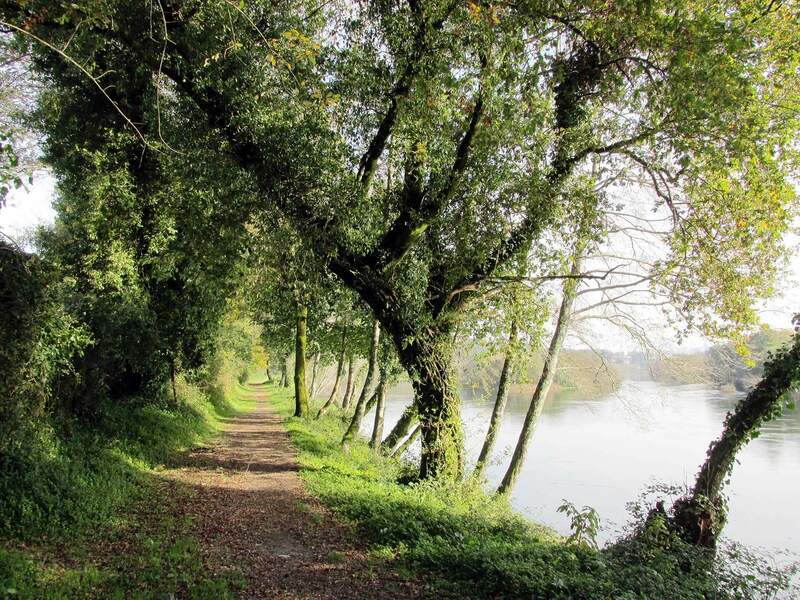 Some trails also follow water courses, making them into calmer strolls along riverbanks. Come and discover them! 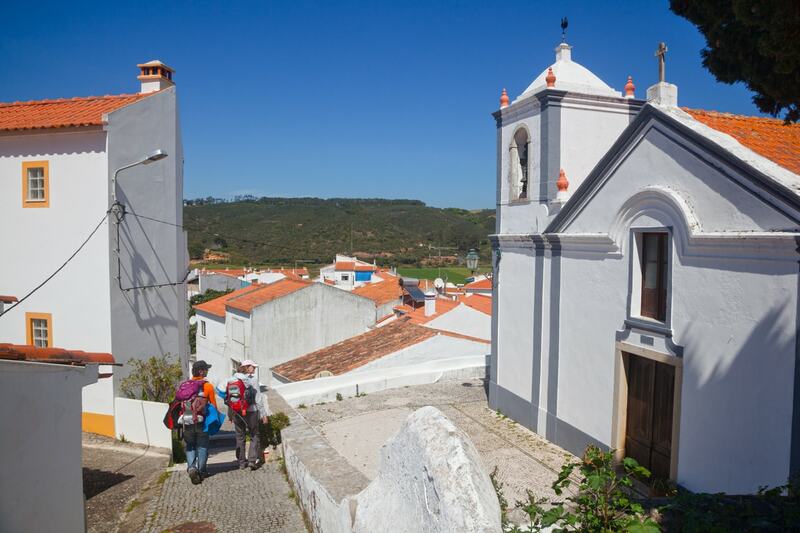 We invite you to discover the GR22 – Grand Route of Portugal’s Historical Villages and its 12 stages that start and finish in one of the 12 Historical Villages in Portugal. Just decide which one is for you, or choose to discover them all at your own pace. 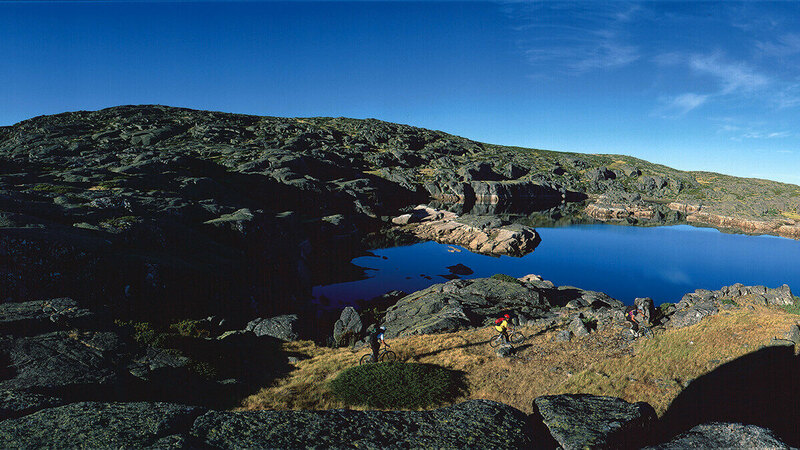 The Zêzere Grand Route follows the Zêzere from its source, in the Serra da Estrela, to its mouth in Constância, where it meets the River Tagus. This Route runs through the territory of the Xisto Villages and can be enjoyed in sections or multi-surface sections. Dare to discover the beautiful landscapes surrounding the Côa River and discover primitive art on trails forming part of the Côa Grand Route. This pioneering route gives you an up-close and personal look at the Côa river and its biodiversity, combining the experience with the region’s cultural, archaeological and historical heritage. Listed as a World Heritage site since 1998, the Coa Valley, is widely considered as the most important site with open air rock art. 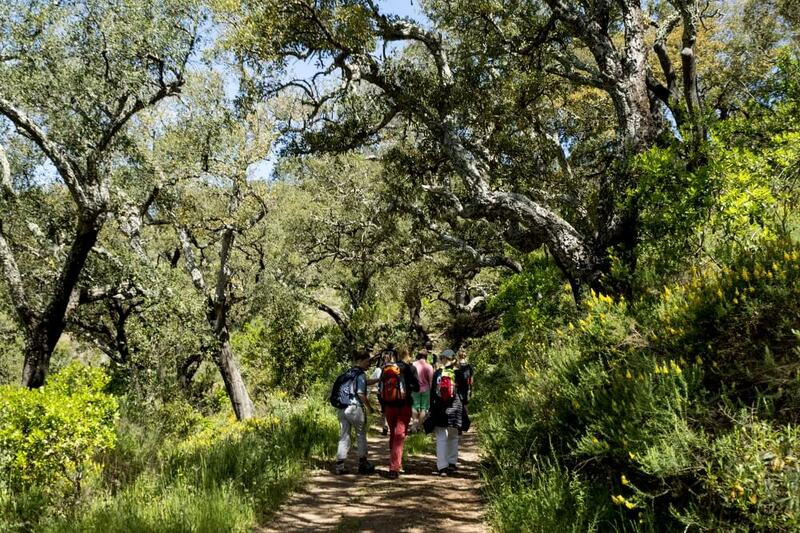 You can also venture onto the Dão Ecopista, an easy to walk linear route with a length of almost 50km, running through a natural area with lots of vineyards and agricultural communities. Regardless of the route you choose, the experience will be worth it! Browse all the information about Routes, Programmes and Services provided by companies in the region. 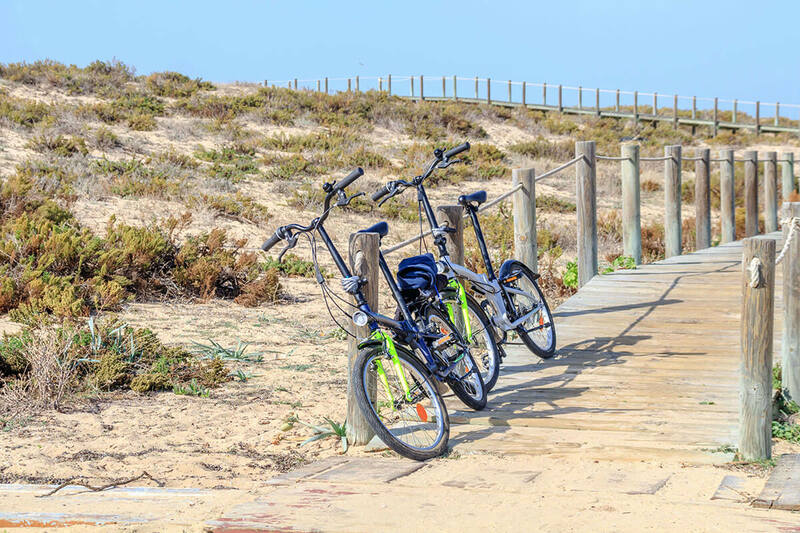 Pedalling with your eyes on the horizon along the Atlantic Coast, enjoying the dawn breezes and wandering the long stretch of coastline teeming with beaches means you are taking the Eurovelo 1 – Rota da Costa Atlântica Norte route. Along the roughly 250 kilometres, sections 16, 17 and 18 lead you to discover Espinho, Vila Nova de Gaia, Porto, Matosinhos, Vila do Conde, Póvoa de Varzim, Esposende, Caminha and Viana do Castelo, cities and towns so markedly northern that it’s impossible to not fall in love with them. 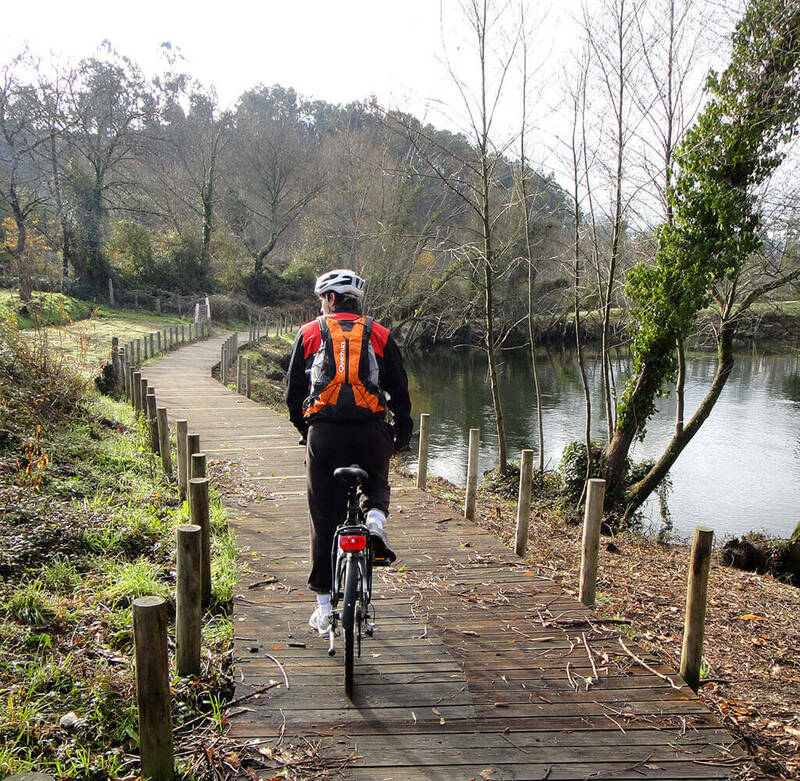 On the banks of the river, the 70-kilometres Ecovia do Rio Lima, allows you to bike across the municipalities of Viana do Castelo, Ponte de Lima, Ponte da Barca and Arcos de Valdevez. 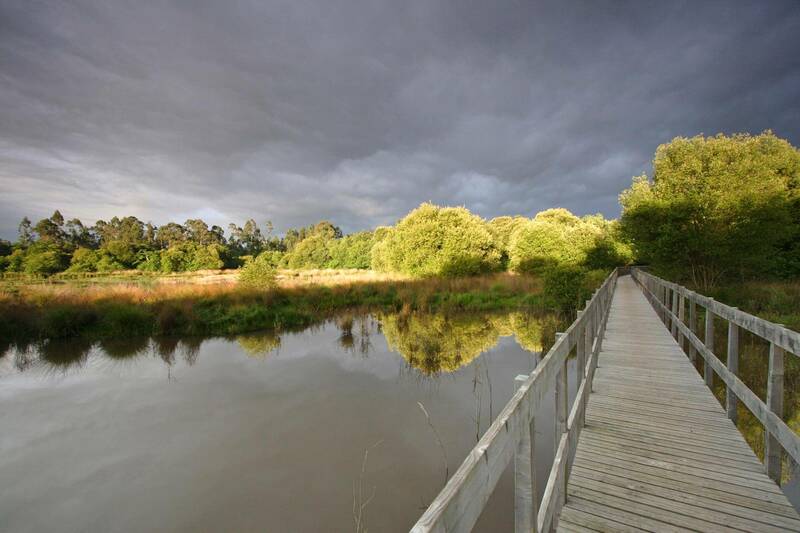 Recreation areas, riverside country roads bordered by native vegetation, ponds, and wooden footbridges diverge into six spectacular trails. 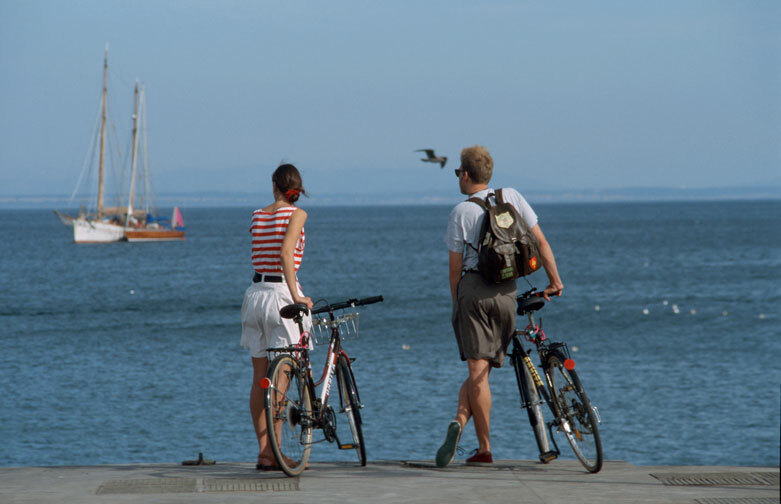 While on the coast, discover the allure of the old railway section that connected Monção to Valença and the roads running parallel to the Minho River between Caminha and Vila Nova de Cerveira. 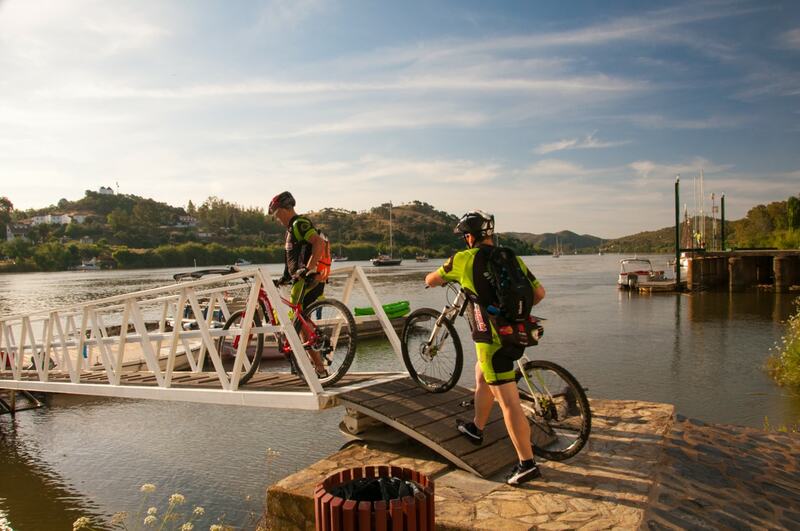 The Ecopista do Rio Minho stretches for 40 kilometres through vineyards, farmlands, and lookout points with vistas out to the river. 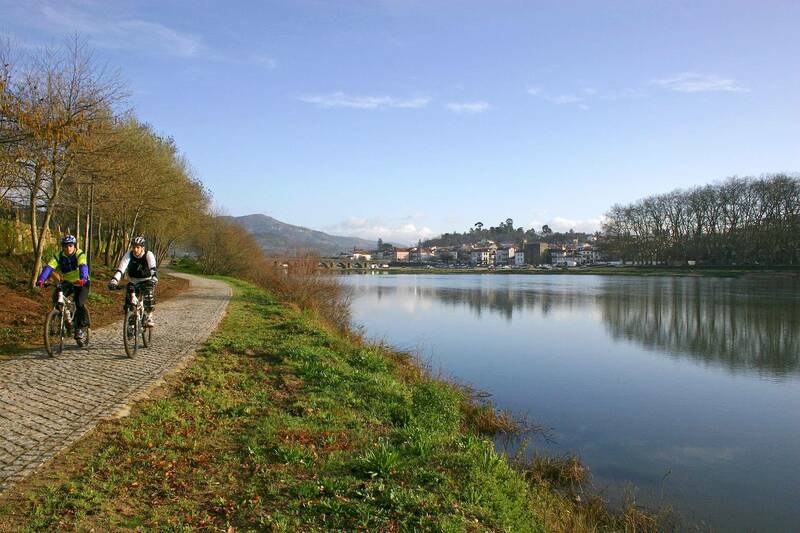 Don’t leave without taking the “Caminho do Rio” (River Way) between Caminha and Cerveira. 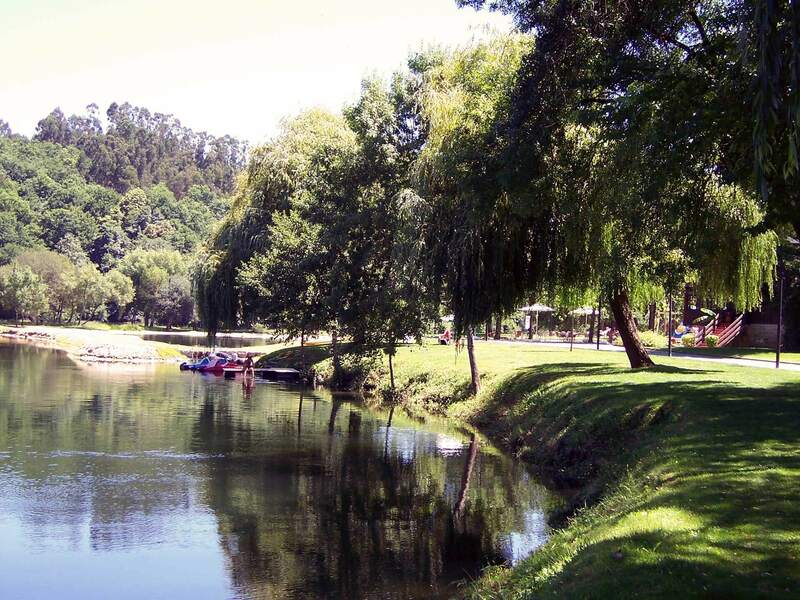 Enjoy the examples of carochos, Minho River’s own traditional boats; visit the Ecotrail Information Centre in Valença and sample the cuisine and Vinhos Verdes of this wine region. Venture through the region’s interior and follow one of the most iconic stretches of railways in the north of the country, decommissioned since 1990. 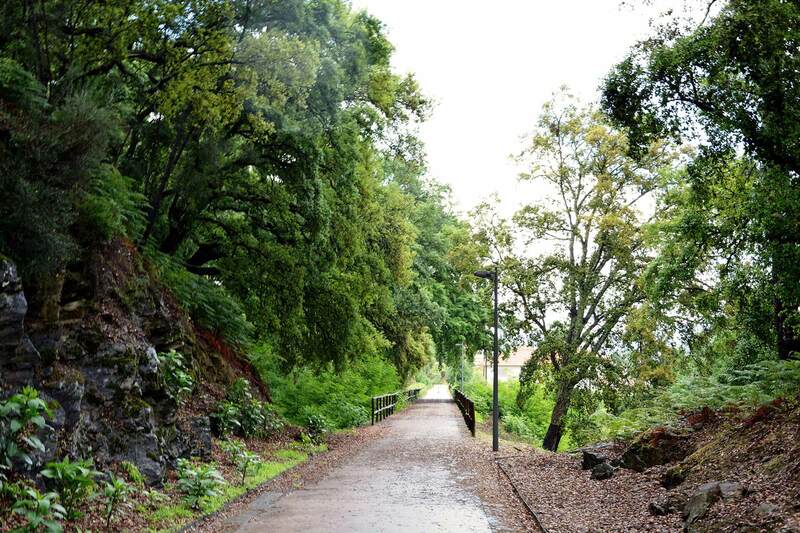 The Ecopista do Tâmega, about 40 kilometres in length, connects Amarante to Cabeceiras de Basto, cutting through Celorico de Basto. On this route you get to know Tâmega Valley, the Marão Mountains, the Nature Park of Alvão and Terras de Basto and its historic centres. Throughout the byways and crossroads of the vast northern region resonates the history and tradition of a country born here over seven centuries ago. To travel the Linha do Tâmega Ecotrail is to discover those roots. 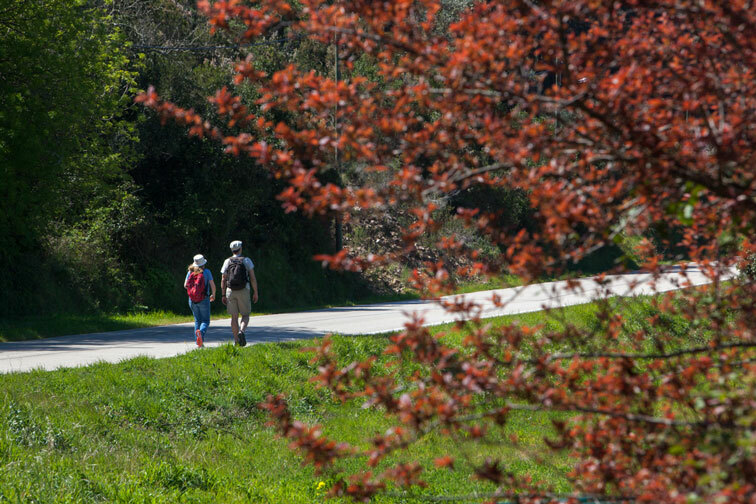 Included in the European network of greenways, its roughly 40 kilometres is an excellent choice for walking and exploring the train route that connected Amarante, Celorico de Basto and Cabeceiras de Basto until the end of the 1990s. As we journey towards the coast, two rivers accompany several routes of tremendous natural and scenic wealth. 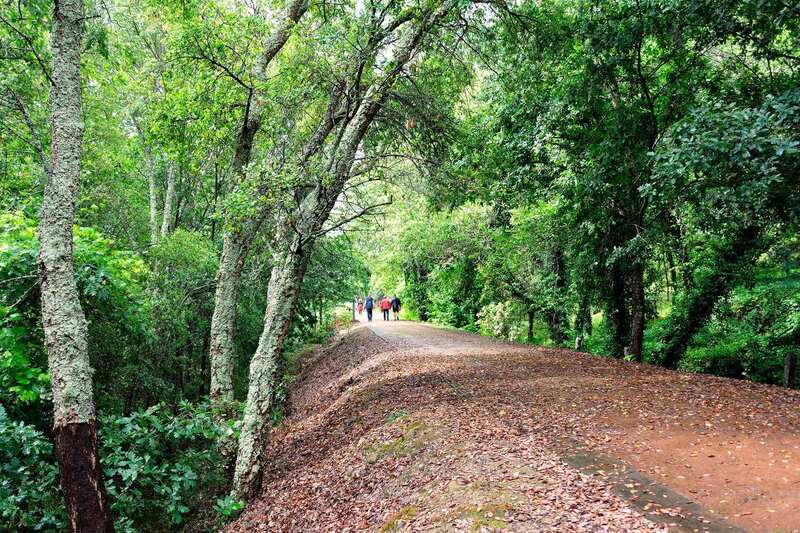 Starting from the Ecopista do Rio Minho, along the banks that join the municipalities of Caminha and Vila Nova de Cerveira, it is possible to explore two extremely ancient historic centres and access the “Caminho do Rio” on this old 40-kilometer long railway line between Monção and Valença. 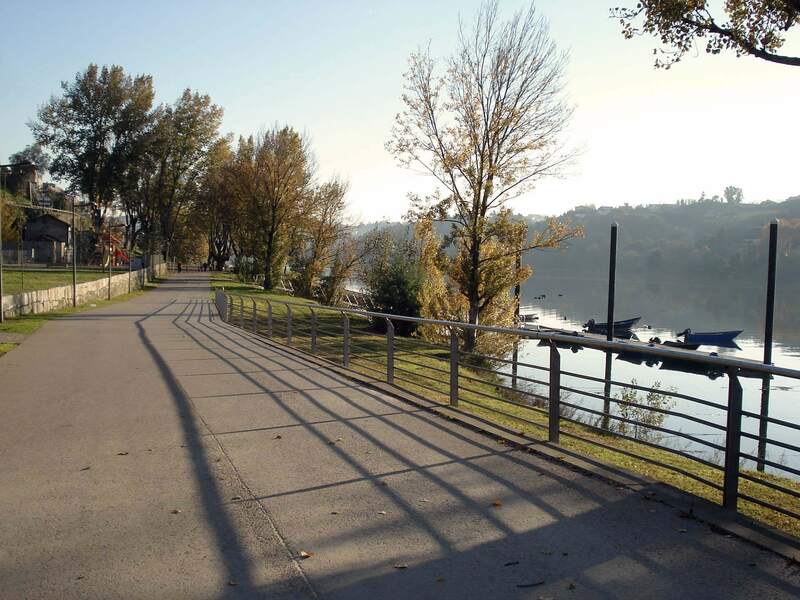 In its turn, the Ecovia do Rio Lima is perfect for those who like to walk along the river’s edge. About 70 kilometres long, it is made up of six remarkable routes. Along the right bank, the walk takes us between Viana do Castelo and Ponte de Lima and between Ponte de Lima and Ponte da Barca. On the right bank we get to know other walks in Ponte de Lima and the traditional villages of Arcos de Valdevez, lined with orange trees. 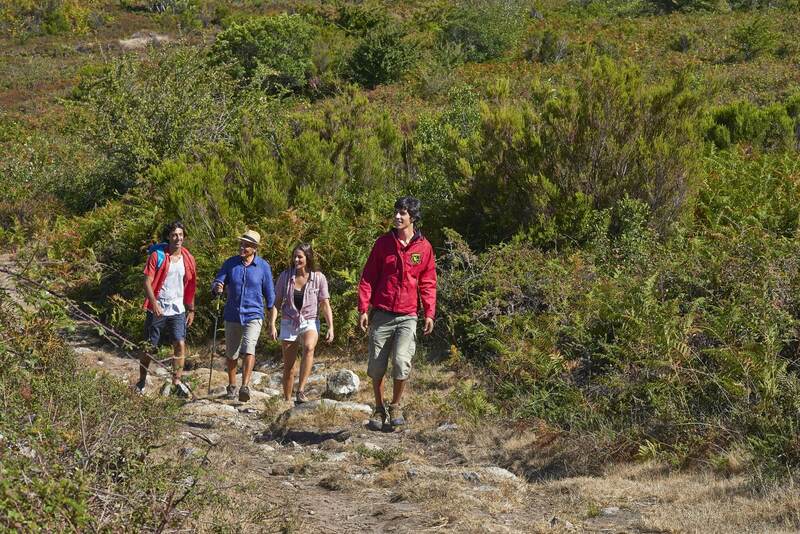 For your hikes and strolls, arm yourself with maps and brochures covering everything you can see and do in Porto and the North, and... enjoy every moment!